sqadia.com is a solution for medical students where they can get high quality medical video lectures along with PowerPoint presentations by numerous medical specialists. 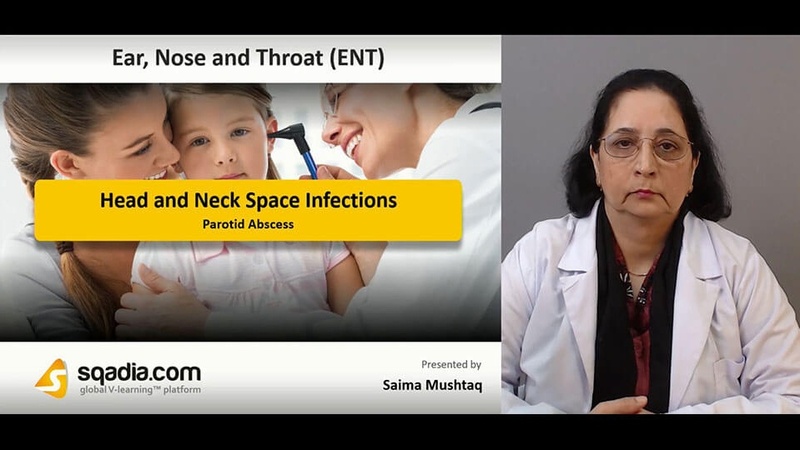 The lecture head and neck space infections by Dr. Saima Mushtaq aims to elaborate parotid abscess, Ludwig’s angina, peritonsillar abscess, retropharyngeal abscess, and parapharyngeal abscess. All these abscesses are concerned with suppuration of the parotid space, connective tissue disorder of neck, collection of pus in the peritonsillar space, collection of pus in the back of the throat, and abscess of pharyngomaxillary space respectively. 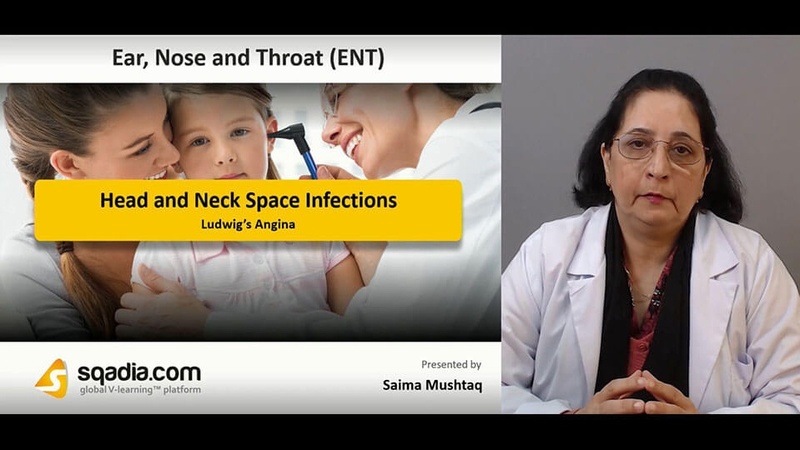 At sqadia.com, medical specialist Saima Mushtaq delivers detailed medical lecture of ear, nose, and throat course on the topic of head and neck space infection. This section of the ENT lecture is based on Parotid abscess. Parotid abscess is suppuration of the parotid space. Contents of parotid space include parotid gland and its associated parotid lymph nodes, facial nerve, external carotid artery and retromandibular vein. Aetiology of parotid abscess is dehydration, particularly in postsurgical cases and debilitated patients, with stasis of salivary flow is the predisposing cause. Multiple small abscesses may form in the parenchyma. The medically important microorganisms playing a role in causing parotid abscess are Staphylococcus aureus, Streptococci, Anaerobic organisms, and rarely gram-negative organisms. The lecture head and neck space infections made by following the medical book ''Diseases of Ear Nose and Throat'' for MBBS students also focuses on the medical aspects of Ludwig’s angina. Ludwig’s angina is a form of cellulitis or connective tissue disorder that affects the submandibular, sublingual and submental spaces i.e. the area under the tongue and neck. The causes of Ludwig’s angina are dental infections, submandibular sialadenitis, injuries of oral mucosa, fractures of the mandible. Clinically, Ludwig's angina shows odynophagia, trismus, cellulitis. Dr. Saima Mushtaq also explains the treatment of Ludwig's angina diagrammatically in her PowerPoint presentation. Firstly, systemic antibiotics are given to the patient. If airway is endangered, tracheostomy is carried out. Peritonsillar abscess is discussed comprehensively in the medical video lecture at the platform of sqadia.com for medical and MBBS students. Peritonsillar abscess is a collection of pus in the peritonsillar space which lies between the capsule of tonsil and the superior constrictor muscle. Peritonsillar abscess usually follows acute tonsillitis without previous history of sore throats. Clinical features of peritonsillar abscess are divided into general and local features. General features comprise fever, chills and rigors, general malaise, body aches, headache. Local symptoms follow severe pain in throat. Usually unilateral, odynophagia, ipsilateral earache. Treatment for peritonsillar abscess is hospitalization, intravenous fluids to combat dehydration, antibiotics, analgesics. Complications associated with peritonsillar abscess is oedema of larynx, jugular vein thrombosis. The collection of pus in the back of the throat is referred as Retropharyngeal Abscess. Clinical features of retropharyngeal abscess are dysphagia, difficulty in breathing, torticollis, and bulge in posterior pharyngeal wall. For treatment, incision and drainage of abscess is done. This is usually done without anaesthesia as there is risk of rupture of abscess during intubation. Also, systemic antibiotics are given. Chronic retropharyngeal abscess is caused by tuberculous infection of retropharyngeal lymph nodes. Clinical features are discomfort in throat, dysphagia, and tuberculous lymph nodes. Treatment of chronic retropharyngeal abscess is carried out via incision and drainage of abscess and full course of antitubercular therapy. 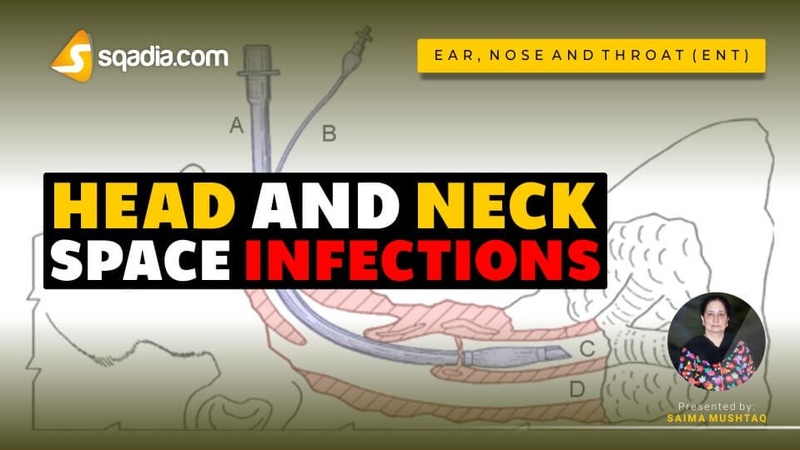 At sqadia.com, according to the medical syllabus of ENT course, parapharyngeal abscess is also discussed under the chapter of head and neck space infection. Parapharyngeal abscess is abscess of pharyngomaxillary or lateral pharyngeal space. Clinical features of parapharyngeal abscess depend on the compartment involved. Anterior compartment infections produce symptoms i.e. prolapse of tonsil and tonsillar fossa, and trismus. Posterior compartment involvement produces bulge of pharynx behind the posterior pillar and swelling of parotid region. For MBBS students, the complications of the disease are enlightened comprehensively in medical video lectures of sqadia.com for better understanding. The complications of parapharyngeal abscess involve acute oedema of larynx with respiratory obstruction, spread of infection to retropharyngeal space, and carotid blow out with massive haemorrhage.